Employee Pricing Event is HERE! "These are by far the best windows I've ever seen! The installation was timely and the customer service was unreal!" "Every time I connect with Landmark I am very happy"
"These guys really know what they're doing." "Incredible service and staff. Would certainly recommend this wonderful company." Bringing the beauty of the outside into your home with style & elegance. Find the right window for your space in our comprehensive product selection. We can help you find the right product at the right price for you. Don’t wait to make a statement with Landmark’s custom doors. We have several options for all exterior door needs including; entry, garden and sliding patio. 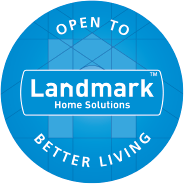 Let Landmark improve your curb appeal today. The rain is inevitable, but home damage isn’t. Get protected and be prepared with Landmark’s unbeatable Xtreme Gutter Guard. As a first time buyer, we can appreciate that buying new windows can be daunting. Let us help you find your inspiration!